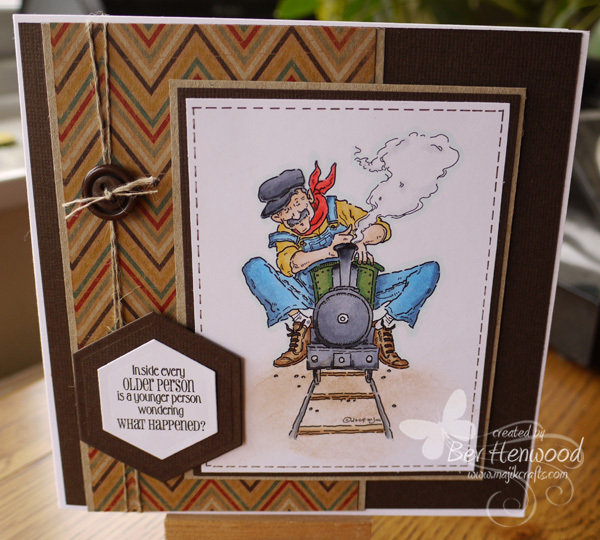 Majik Crafts: Full Steam Ahead! Finally I have found an hour or so to do some blogging! It has been hectic here with forms (all to do with my MIL) swishing in and out of the post almost daily ~ if I see another form I might just scream! Now my attention has turned to Christmas ~ for the first time since I left home (don't ask how long ago that was) I will be spending Christmas Day with my Dad. The story is complicated, so I won't bore you ~ but suffice to say I am soooo excited and want everything to be just right! Today I have a card I made for my Dad's Birthday, which was yesterday ~ so even if he does look on here it won't spoil the surprise now. My Dad loves Steam Trains ~ so when I saw this digi image by Mo Manning earlier in the year I had to have it! Also, a first for me ~ I have used a button on the card ~ I have quite a selection of buttons, but always struggle to incorporate them into the theme of a card ~ I am quite pleased with this one. Right ~ now it's time for the Beardie tea time stroll round the block before they have their dinner. It sound horrible out there ~ wet and windy, so I am not looking forward to going outside in all that. JUst ORgeous! LOving all your colours and this cute image...FABulous sentiment too. Lovely card. Great backgroundpaper for a menscard and I love the digi's from Mo Manning too. And your button looks fine :-) so does your colouring. I think your father loves this card also. What a fabulous card Bev, love the image and wonderful colouring, I bet your Dad loved it..
Well I missed this one making an appearance .. .. and it is great! Love the sentiment, it really made me smile!! I hope things settle down for you soon with your MIL and that you can have a nice relaxing Christmas.